SMS (Short Message Service) is a text message sent by one person to another by the medium of a cell phone. SMS marketing is the term for the use of SMS as a marketing channel. Today, most of the companies have tight marketing budget as a result of which, clear benefits and a high return on investment is expected out of every single channel. SMS marketing today, because of its various advantages has become an important part of the multi-channel marketing. And if you are not utilizing its benefit then you are missing out on a big marketing opportunity. One of the biggest advantages of SMS marketing is that, SMS can reach a customer’s mobile devices instantly and quickly, as compared to the E-mail and mobile push notifications which requires the user to be connected to the internet. Less than 7 seconds is the required average timing for all mobile carriers and the SMS to move from one person to another. It is definitely an advantage over email and push notifications as the push notification and emails at times are received or sent late due to the poor internet connections. Still being the preferred medium for instant and personal messaging, with Facebook making the reaching and personally targeting customers more difficult, cumbersome and costlier than ever, more and more people have turned to SMS. SMS being the original messaging medium still remains the market leader resulting in SMS having a very high return on investment. It has been found that SMS delivers around 1600% return on investment which has placed it among one of the most efficient marketing channels. SMS marketing has always been one the most inexpensive method of communication in comparison to the traditional marketing mediums. SMS marketing reinforces the brand among the customers. One could leverage upon SMS as a channel to stay on top of the customers’ mind by engaging them with communication that is in line with the rest of the marketing. This has always been one of the major benefits of the SMS marketing. It has been found that 95% of the SMS messages are read within 2 minutes of receiving them which makes SMS engagement rates quite huge as compared to the E-mails. Thus, SMS can deliver critical information with a very good success rate. Coupons and promotions have proven to be an excellent way to a greater number of people to stores or websites. SMS is a great channel to communicate your offers while conducting a limited time sale or promotion, as obviously one wants many people to know about it, especially when the consumers are on the move. With this way, one does not have to worry about what they miss out because they didn’t get message on time. Text message marketing provides the subscribers the option to provide as much little information they wish to provide. This flexibility is often attractive for the customers in general as this gives them the control. SMS proves to be a much better channel for communicating information in places where data is very expensive and demand for Wi-fi is low. Feedback from customers often proves to be fruitful and SMS has always been great channel to receive feedback from the customers via surveys. Research has shown that on an average 35% customers respond to a surveys via SMS with the average response time for users being less than just 5 minutes leading to great results in a very short period of time. SMS marketing gives an advantage to the customers make the first move by adding a short code or keyword to print collateral, advertisements and advertising boards as well as social media. This strategy makes the customers familiar with a brand’s code and the keywords and hence they are more likely to interact and respond. Research has shown that open rate of SMS message is a whopping 93% as compared to the 30% for the email. Often customers carry their mobile phones in their hand which makes communication of message easy to them. Solid open rate has made SMS marketing advantageous over the years. Use of marketing automation tools such as Gleantap helps in sending event triggered SMS messages to the customers based on their intent and action on the e-commerce store. Event-triggered SMS has proved helpful in engaging customers who are high in value and intent. One of the big benefits of SMS marketing is that SMS can often be scheduled to be sent at a certain date or time which frees up the resources and ensures they aren’t sent during unsociable hours. One of the major advantages of SMS marketing is its when one integrates it into one of the marketing campaigns. A simple integration of SMS with other market methods to create drip campaigns gets the message straight to the customers and ensures that they know what you have to offer them. We all know that mobile is here and surely it isn’t going anywhere and will stay here for a long time. But, what makes SMS so attractive is its compatibility with every other mobile phone so there’s no need to worry about eliminating any user or getting the customers on board with the brand-new technologies. Very often we see that email and direct mailboxes are populated with unnecessary junk mails and spam which is very irritating. With SMS marketing customers can only opt in to SMS updates from the company they wish to so one can always know that they are delivering the message to the right person without being lost or ignored. This gives a very good opportunity to make the customers feel really special as it is easy to personalise each message and does not take extra time. 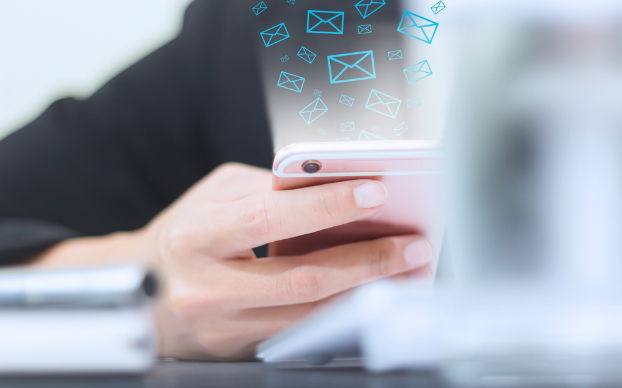 Now that you know how beneficial text message marketing can be, and why it should be preferred over email marketing and other marketing channels. Not only SMS Marketing cost efficient but it’s also easy and comfortable to use in comparison to emails. And as we see there’s also a high return on investment. Hence there’s every reason for you to switch over to SMS Marketing. It’s force to reckon with and its definitely the future. Aishwar Babber is currently as working at Gleantap, as an outreach manager. He is a passionate blogger and digital marketer. He loves to talk and blog about gadget, and latest tech, which motivates him to run GizmoBase.